it's pretty unassuming but i'm very proud of this one. 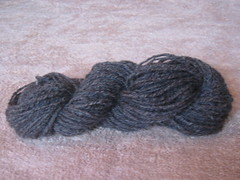 shropshire, 110yds, just over 4oz (i got a generous 120g in my 100g bag), average 10wpi, 3-ply. described as dark grey, but it's definitely on the browny side. it took just over 24 hours from bag of fluff to finished yarn. it's going to be the first of my rug wools, so i'll try to get the others to match this weight. it's the first time i've aimed for a certain size, rather than just gone for the finest/smoothest i could. this definitely would have gone finer, but i wanted something pretty chunky. i'm pretty damn pleased with the result, it's dense and strong, but still has some bounce. it's slightly overplied, but seems to be straightening out as it dries. it's still noticeably uneven, but i think that's a lot of the charm of handspun so i'll be sad to see the back of it once i get to be any good. i tried my hand at navajo plying and it went fine, once i'd worked out how to get enough tension on the singles to tame the rather lively twist (i ran it around me and over my shoulder, i like the idea of wrapping onto weighted plastic bottles, but i didn't want to unwind it from the original spindle). the 2 things i'm most pleased about with this are the length and the evenness of the twist. i managed to get the whole 100g onto my big spindle, though it was getting pretty unwieldy by the end, which works out at 330 yds of unplied singles. all happily plied back together without a break. yay! finally a decent length skein :D i've started to feel the twist in my drafting fingers too, so i can judge the amount of twist in the yarn no matter what the length, same with judging how much spin to put into the ply too. i guess this wouldn't work as well for a yarn with less twist (i knew i wanted a lot of twist both for the navajo plying and the end use), but maybe my sense will develop so i can feel less twist too. but i'm pleased that i've found a reasonably reliable subsitute for looking at how the plied yarn hangs, since i found out that this is utterly unreliable. the shropshire was nice to work with, 3-4" staple (have realised my previous measurements will be off as was measuring stretched not relaxed), a mix of dark grey-brown and white fibres, quite crimpy and grabby so easy to draft. coarse compared to the bfl but not excessively so. no idea if it's recommended for rugs - all the spinning info i can find is that it's a "medium" wool - but i'm hoping the high twist and navajo ply will help it to stand up.